You knew it was only a matter of time but, yes, someone has finally written a piece on how Apple’s blockbuster quarterly results are actually bad news for the company. And we should totally take Rosenbaum’s analysis seriously because a year and a half ago, he was the guy who asked “Is Google Glass A Siri Killer?” and he was obviously right about that. You remember Google Glass, right? It used to be a thing—a thing that could get you punched in the face—but now it’s on hiatus as it’s being “redesigned”, possibly to include a face guard. Presumably the redesign is needed because it was too awesome and Apple product-killing. It’s hard to imagine that Apple’s stunning profit report is anything but good news, but I’m going to go out on a limb and say that what we’ve just witnessed is the beginning of the end of Apple. What’s not to like about this situation if you’re either an Apple owner or stockholder? 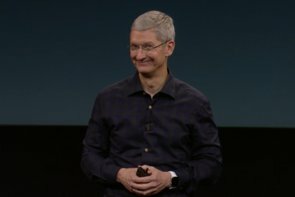 Despite their bullish guidance for next quarter and the fact that Apple always issues guidance it feels it can reasonably meet, Apple investors should listen to the unending stream of lunacy that regularly spews forth from the Forbes contributor network like confetti from a clown cannon. ...now the major carriers are shifting away from long term contracts and subsidized phones—and for the first time customers are facing sticker shock at just what a new iPhone is going to cost them in cold hard cash. Hey, guess what! You’ve already been paying for the phone no matter what carrier-friendly term it was disguised under. Carriers have been trying to shift away from so-called “subsidies” for years now and Apple keeps selling more and more iPhones. For example, with Verizon Edge you pay monthly installments of $750 (the full price of the phone). Yes, the Macalope is actually on this plan and what Rosenbaum means is monthly installments on $750. The real dark cloud on the smartphone horizon are the Chinese manufactures like Xiaomi, Lenovo , OnePlus and Huawei who are driving down prices the market with Samsung comparable Android devices at lower price points. It’s February, 2015 and Rosenbaum is still writing “I don’t understand Apple’s business model!” on his checks. Apple’s customers are not primarily price-sensitive. They’re experience-sensitive. Throughout 2014 we heard “Xiaomi is going to destroy Apple!” And who did it destroy? Samsung. So – while this quarter’s massive Apple profits are impressive, Apple isn’t going to be able to keep up that pace without some pretty complex and inherently risky maneuvers. And Apple’s run by a bunch of country bumpkins who do nothing but gawk at the big city lights. Apple fans, get ready for a rough ride. We’ve heard this ride’s been coming for years. It’s apparently at the same perpetually waiting-to-open theme park as other fictitious rides like “The Year of Linux on the Desktop” and “Windows Phone Overtakes Android.” It’ll open sometime after Jurassic World.